I love staying at our two-bedroom beach house at White Beach, a two kilometre stretch of white sand edging a turquoise bay, shallow and calm, excellent for swimming and family water fun. The beach is pristine, there are birds everywhere, the sky is always changing, as is the light on the hills. Did you know you can see Mt Wellington in Hobart from the beach? Your access to the beach will take less than a minute, depending on whether you take one of the paths leading to the beach directly across from the house, or choose to walk to the pathway at the bridge (2 minutes away). The main bedroom and living area have beach views, all day, every day. A selection of good glassware will allow you to accompany your meals with whatever beverage takes your fancy. There is a leaf teapot and a ground coffee pot, as no one can begin a day without one or the other. The dining table and six chairs make dinner special. The deck has a six-seater table and six deck chairs (stored in the shed). There is a gas-fired BBQ and an umbrella for you to use, as well. The sitting area is very comfy - light-filled all year round from the large windows. There is a couch begging for afternoon nappers, a TV and DVD/CD player. There are books, movies, music and games for your pleasure. Light the fire in winter. Be careful though to not overfill, as the house heats very quickly. The main bedroom has a queen-size bed fitted with cotton sheets. Cotton towels are provided. 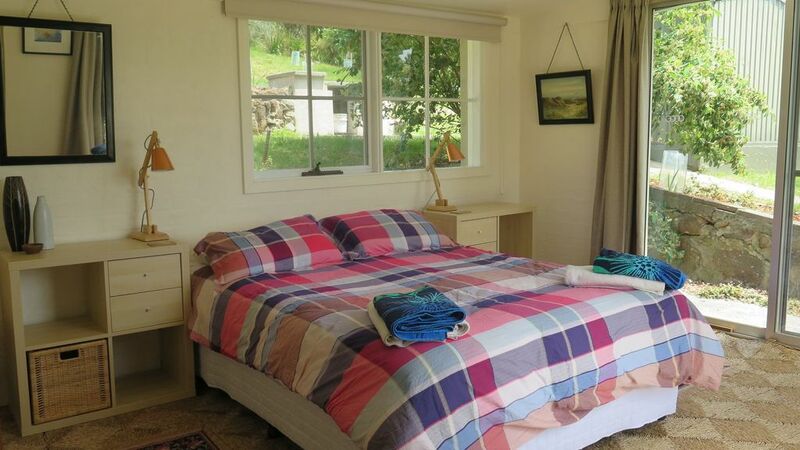 The second bedroom has two single beds, also fitted with cotton sheets. There is also a fold-out ottoman that can be used for a fifth person. If you require the fifth bed to be made up, please ensure you let us know at the time of your booking so we can supply bedlinen and towel. A spacious shower, separate toilet and washing machine plus iron etc are off the sitting area. The house is connected to the NBN and enjoys fast WIFI. If you like fishing, there are some rods in the shed and a tackle box. Pademelons, bandicoots and possums visit during the night. Red-breasted robins, fairy blue wrens and other birds visit doing the day, along wiht the neighbourhood chooks who enjoy eating kitchen scraps. The house is located within 12 kms of Port Arthur and the McHenry whiskey and gin distillery, a little further to the Lavender Farm, and a stunningly beautiful 20-minute drive through farmland and forest to the Un-Zoo. A little further on is Eaglehawk Neck where history and coastline meet. Take advantage of the many walks - short and longer that are in this area, as well as the rich convict history. Such a perfect place to spend our New Year’s. A lovely, warm and comfortable home with all the provisions necessary for a spectacular time away with balcony BBQs overlooking the beach. Would stay again! Thank you for choosing our house, and we would certainly welcome you anytime. Had everything I needed. I will definitely be seeking to stay again. Comfortable bed, convenient facilities and a really good location. Great guest, love to welcome Matt back at any time. We loved our stay. The house was well equipped with everything we needed and more. The location was great and the house was cosy. Beds were good and warm. Kitchen was fantastic. This is a lovely property, with all the gear that you need to hide away or entertain. Comfortable beds, good kitchen and appliances. Great outlook over the beach and a great base for trips all around the Port Arthur area.